Since the holidays are fast-approaching, more festive makeup looks are flooding my social media feeds. Personally, I would rock a red lip all year long, but I can completely understand why most people reserve it for special occasions. It's a bright, in-your-face pop of color that commands attention, not appropriate for your everyday wallflower. And while you might get tired of seeing all the red lippies, don't be fooled--not every red lipstick was created equal. There are red lipsticks with a blue undertone that make your teeth look whiter and there are also red lipsticks with an orange base that bring warmth to the complexion. As you can see most of my favorites come in liquid lipstick form and that's simply because they tend to provide an ease of application, as well as increased longevity. That being said, these reds are all my favorite as they suit me differently depending on the look I'm going for. See for yourself! ♥ Covergirl Lip Perfection Lipstick in 305 Hot - While some drugstore lipsticks are good, I've never been WOW! 'd before by them...that is, until I tried this lipstick. I remember taking a risk and trying it out the same night I had a date and boy did that risk pay off. This lipstick has such a glossy formula that it glides on like a dream, yet it also doesn't feather outside my lip line (what voodoo did you put in this stuff?!) Not only that, but it lasts through eating and drinking. It was still there at the end of the day! This is hands down my favorite lippie if I'm feeling like a shiny red lip. 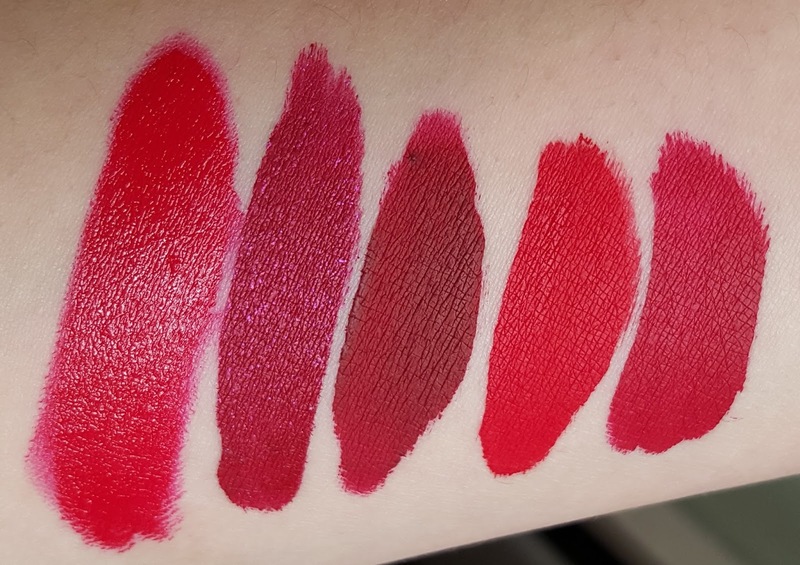 ♥ Jeffree Star Velour Liquid Lipstick in Hoe Hoe Hoe - The brand might not be the most accessible, nor the most clean-cut, but the rockstar edge certainly allows for the uniqueness that brought about this shade. The dark base contrasted against the pink micro glitter seems to attract the light like a highlight does for your face, making your lips look instantly more plump, while still remaining matte. And you don't have to worry about any grittiness; you don't feel the glitter at all. However, I have found that it takes some work to make the glitter really show. If you wait some time for the lipstick to completely dry down, you can run your finger over your lips and BAM, the pink glitter "activates". ♥ LA Girl Matte Flat Finish Pigment Gloss in Secret - When I first saw these pop up at a local beauty supply, I was instantly made a happy camper. LA Girl is so insanely affordable, so to see them enter into the liquid lipstick trend was pleasing. More people would have access to this trend and enjoy its benefits--I love it! Now I picked up this particular shade because I was going for the "vampy" look and I think this lippie succeeds in that area. It is a beautiful wine shade that is as matte as matte can get. And while being the most affordable, I find this lipstick to have the best applicator--it's long, yet slightly rigid, which is perfect for getting sharp lines AND it distributes just the right amount of product to cover my entire lips. ♥ Sephora Cream Lip Stain in 01 Always Red - I know that blue-based reds are a standard must-have, but if you have yellow or olive undertones, you need this! It is an orange-red, which is more flattering on warmer skin tones. I just love how much it pops on me compared to my other reds and yet I would feel comfortable rocking it at any time. Generally, Sephora Cream Lip Stains are much more affordable compared to higher end alternatives, but they're my absolute favorite formula because of how comfortable they are. I don't feel like I sucked all the hydration out of my lips when I wear them. 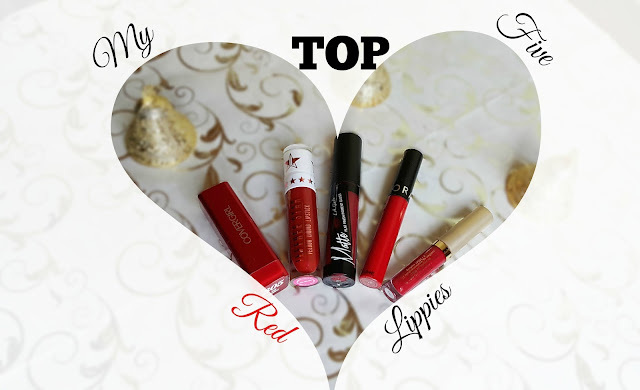 ♥ Stila Stay All Day Liquid Lipstick in Fiery - Stila was the first brand of liquid lipstick I ever tried and as such, it holds a special place in my heart. The formula is much different than all of the others as it is a thicker cream consistency. The Stay All Day Liquid Lipsticks are incredibly pigmented, which means you probably won't even need nearly as much as is dispensed on the applicator. As for this particular shade, I was expecting a warmer red based on the name, but on me it looks like your classic red. And who doesn't need one of those in their arsenal? That sums up my top five. What are your favorite reds?